The 12th Annual Men of Christ Conference will be Sat, Mar. 10, at the Miller High Life Theater in Milwaukee. Fathers, bring your sons. The theme of this year’s conference is “Persevering through the Storm” with powerful speakers Tim Staples, Fr. Robert Spitzer, S.J., Ph.D., Fr. Cliff Ermatinger, & Dave Durand. The conference officially starts at 9am with confession & Adoration available all day. Lunch is included. The day concludes with the Vigil Mass at 4pm with Archbishop Listecki. More details on the flyers and forms in the back of church. Please contact Joe Rayles for special pricing at (715)712-3289 or (248)561-7528 or email at josephrayles@gmail.com. Please join us Wed, Feb. 28 at 6:30pm in the SSPP school gym for Shadow Stations. 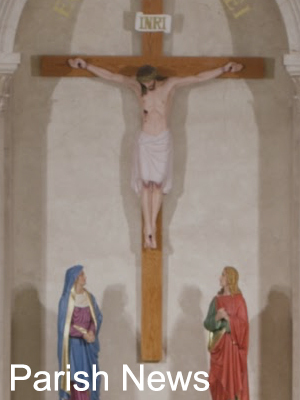 Assumption High School Students will use theater & music to perform the Stations of the Cross. The Shadow Stations are a moving & rich devotional experience that will enhance you & your family’s Lenten journey.